Each time I remove the temple I step back to review the progress. What does it look like now? It still looks like stripes. Four picks complete one row. The stripes lengthen, pick by pick. I hadn’t originally planned stripes, but seeing the results makes me hopeful. 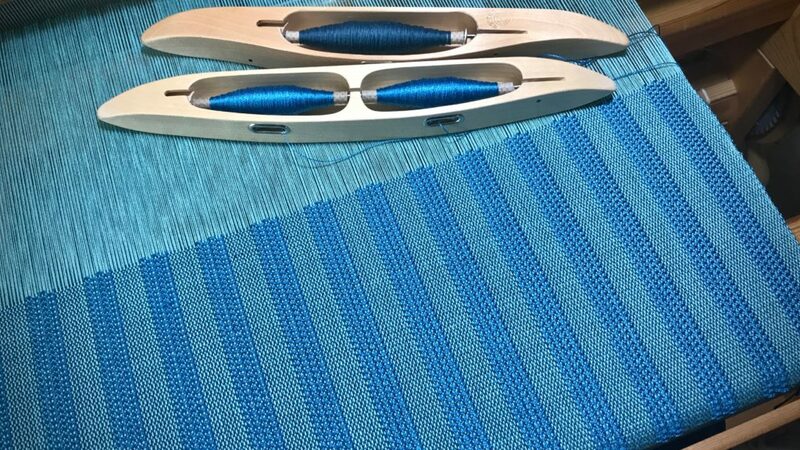 Lengthwise stripes on a solid-color warp are possible with a block weave, such as this kuvikas (summer and winter). 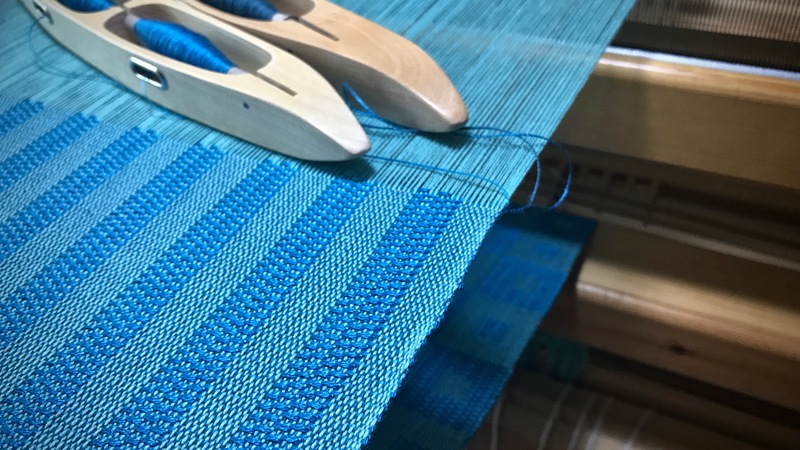 Every fabric has a structure–the particular way that warp and weft threads crisscross each other. 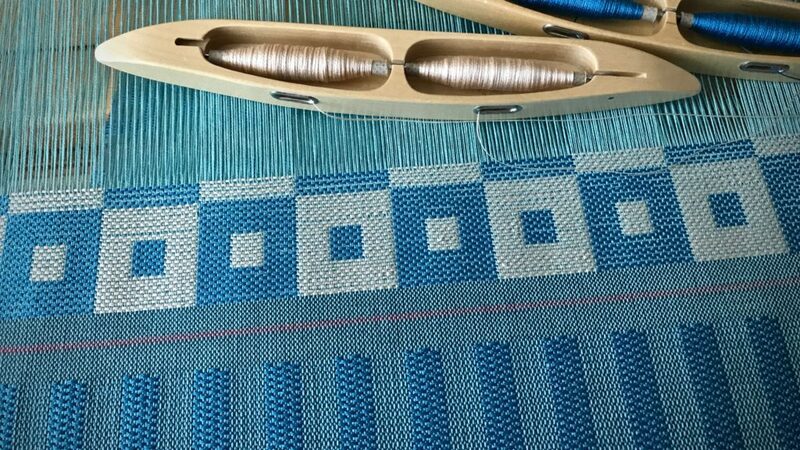 This eight-shaft kuvikas structure sets the stage for weaving block patterns, like the square-within-a-square pattern or these stripes. 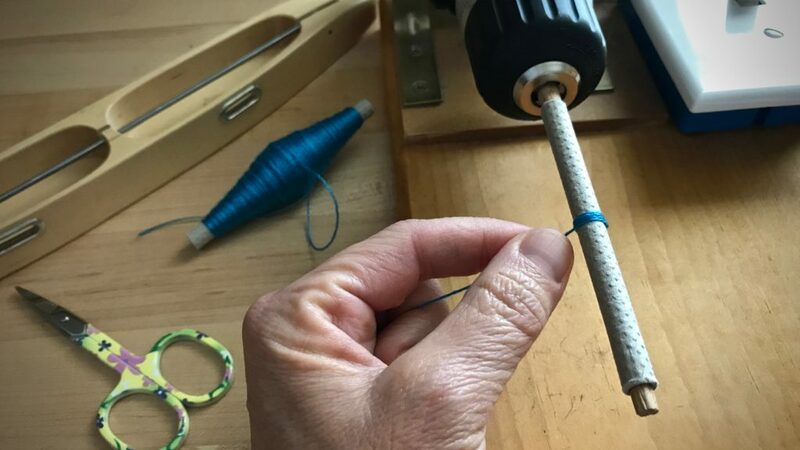 It’s how the loom is set up. 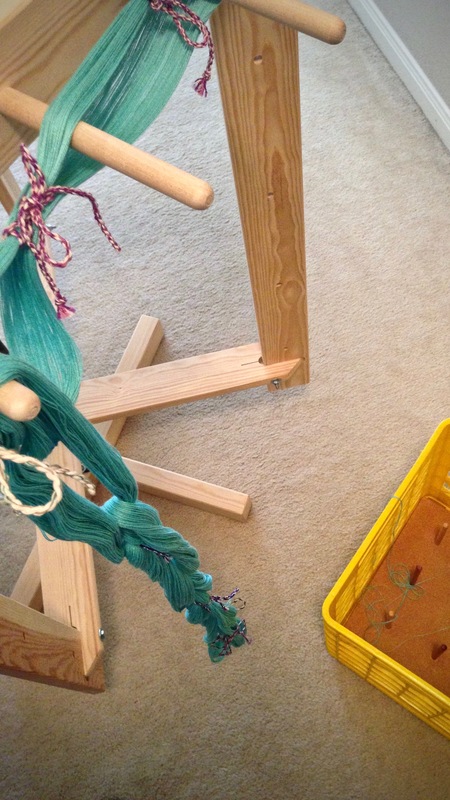 This loom is set up to weave kuvikas. 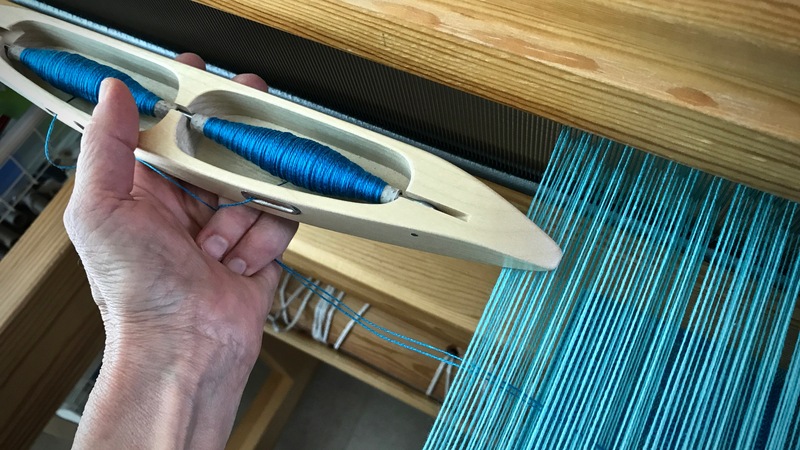 Tencel pattern weft is in the double-bobbin shuttle. 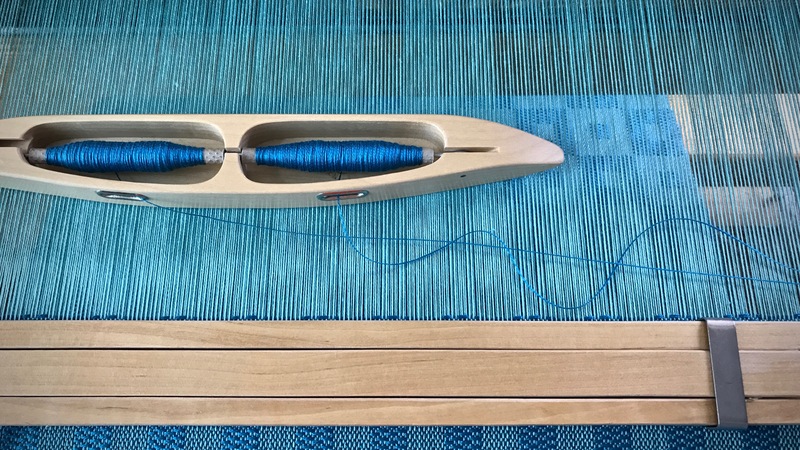 The regular boat shuttle carries 8/2 cotton for the tabby weft. Truth is a constant. It doesn’t change with the wind. It isn’t subject to our whims. It’s how things are. Truth is the structure of creation’s fabric through good times and bad. Imagine the despair of Jesus’ closest followers as they watch him, their friend and Teacher, die in agony on a cross. Where is truth in this despair? Each complete row of pattern is made with four picks–tabby, pattern, tabby, pattern. And then the unimaginable happens. Jesus comes back to them alive! This is the truth of God’s redemptive love–He died for us. Truth awakens hope. Speak truth to your soul. Wait in hope, for glorious fabric is being woven on His loom. May you never lose hope. Thank you so much for stating the Truth! He Is Risen, He Is Risen Indeed. Joann, Indeed it is so! 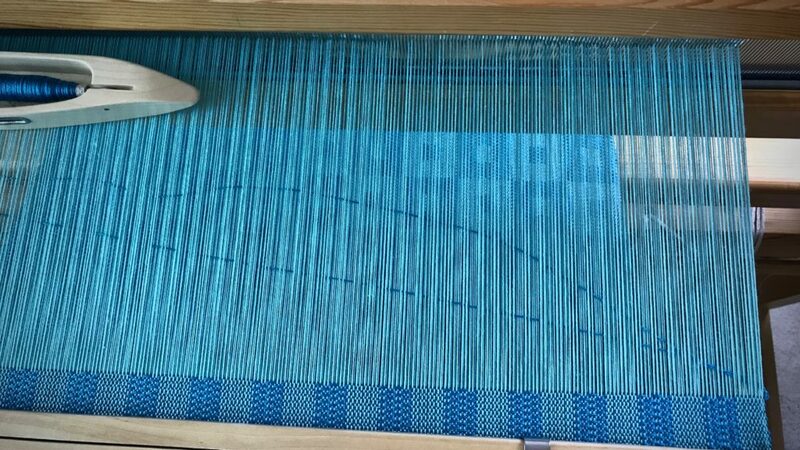 After neglecting this Glimakra Standard loom for a few weeks, I lost my consistency in beating. The first panel, side one of a cushion, has a square-within-a-square pattern. And the squares are not all equal. If I tried to put the same pattern on the back panel, the cushion front and back would not match up at the seams. Each block consists of twenty picks, so there are sixty picks for each row of the square-within-a-square pattern. Consistency in beating is crucial in order to have all the rows of squares equal in size. Stripes to the rescue! The stripes use one of the four possible kuvikas blocks. I get a coordinating pattern without the fuss of trying to match up the sides. 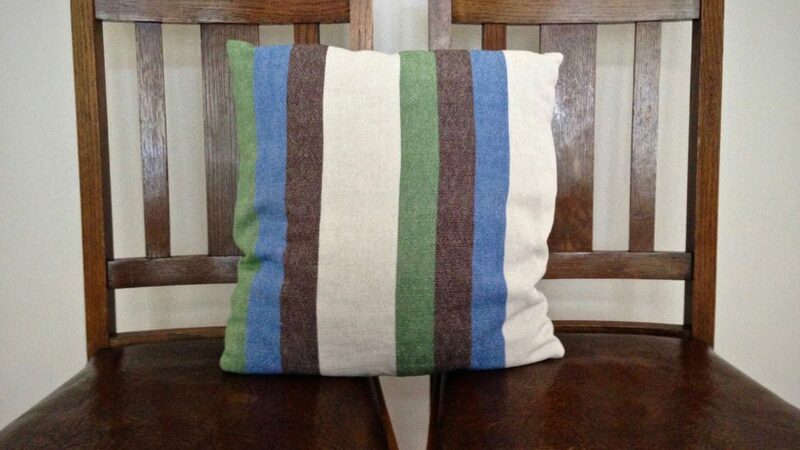 The stripes have a ribbed appearance–simpler than the squares, but still geometric. The patterns are different, but they work together and complement each other. Two red picks separate the front and back panels of the cushion. Repeating “block one” makes a simple stripe pattern. The square-within-a-square pattern is made by weaving two groups of blocks. Group 1: block two, block one, block two. Group 2: block three, block four, block three. There are many different gifts in people; and the gifts all come from the same source. Each gift is like a pattern than can be used in a variety of ways, complementing the other patterns around it. 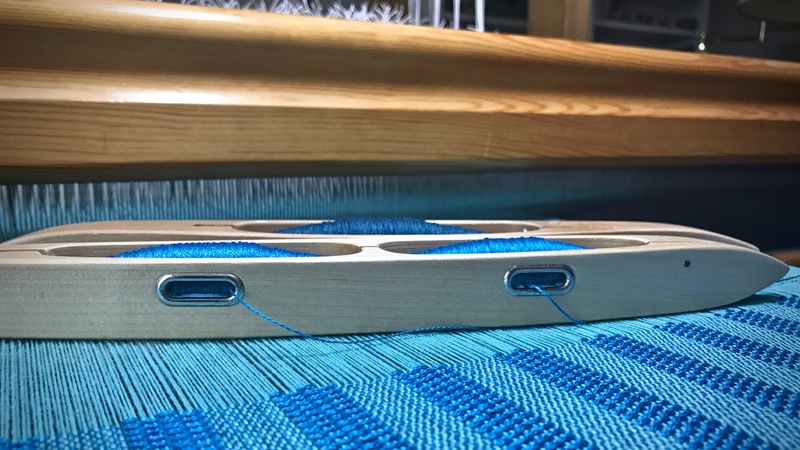 Our Grand Weaver sees the whole project, and places the people with the gifts where they best fit in the overall fabric. You are made for a purpose. Your gifts are exactly what the rest of us need. May your gifts bless those around you. How did you change from blocks to stripes without retying? Love the idea! Hi Linda, It’s easy! The stripe is simply the “dot” at the center of the squares elongated. I am just repeating that one block over and over. Wondering what your fiber is? 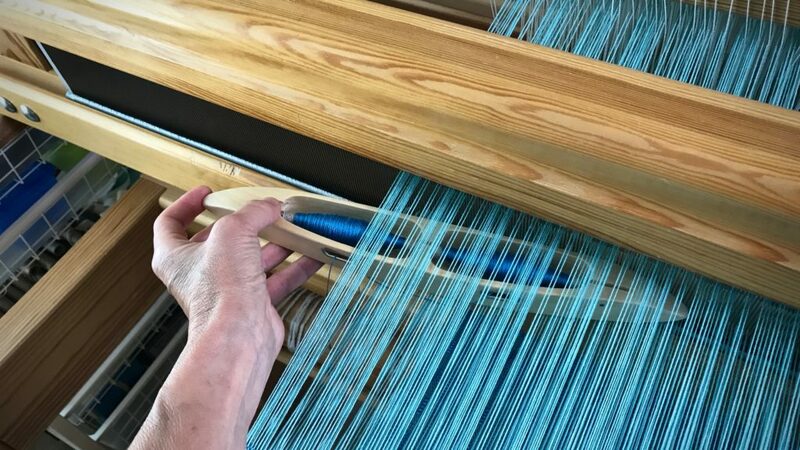 Hi Cynthia, The warp and ground weft is 8/2 cotton. 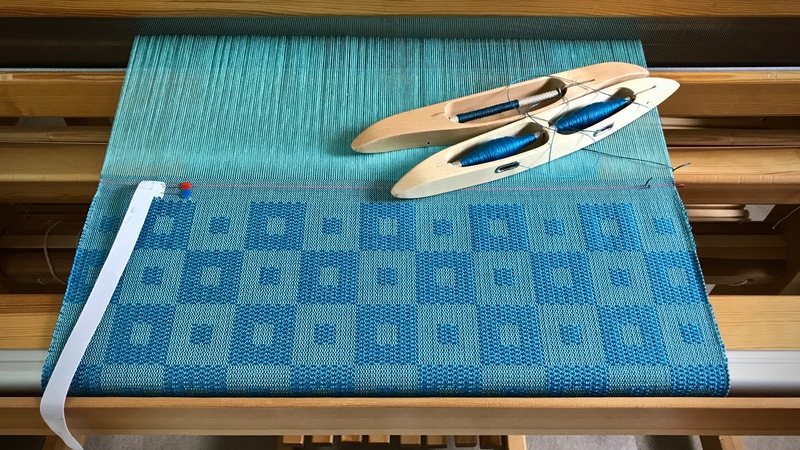 The pattern weft is doubled 8/2 tencel. 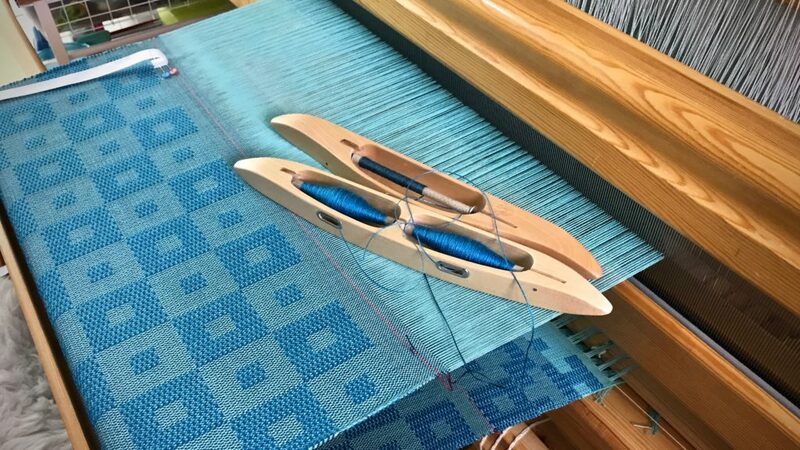 Karen, as a weaving wannabee, I want to tell you how appreciated your sharing of your thought and weaving processes are. Plus your excellent photos make what you share understandable. Thank you, thank you so much. tsw, I appreciate your thoughtful comments so much! 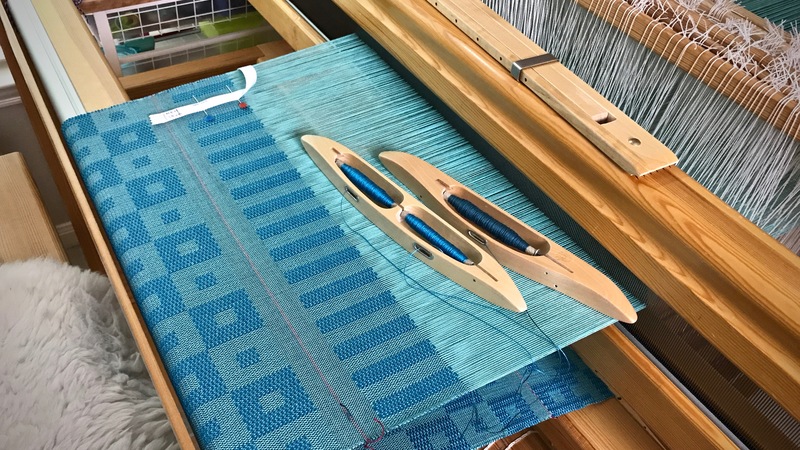 It’s my pleasure to have you *visit* my weaving studio and enjoy it with me. There is always room for more cushions and pillows. 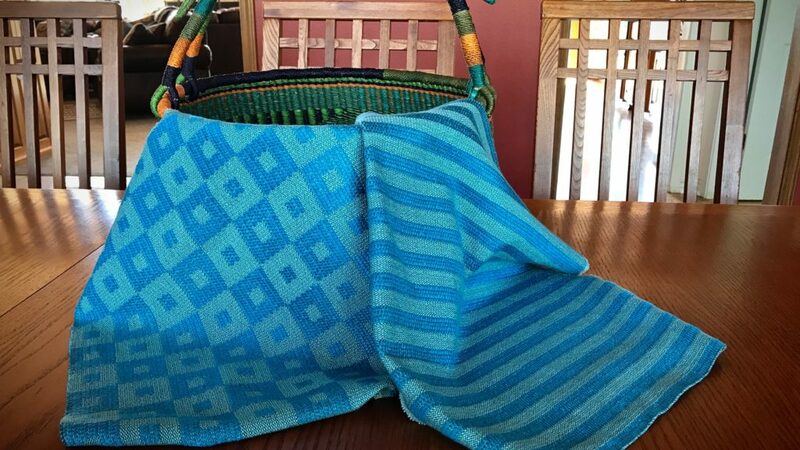 What better way to use handwoven fabric? 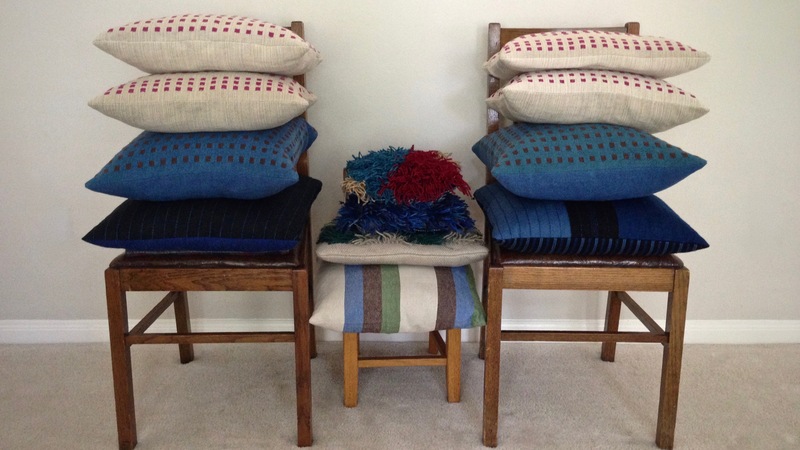 Making cushions puts the fabric to use where it can be seen and touched. 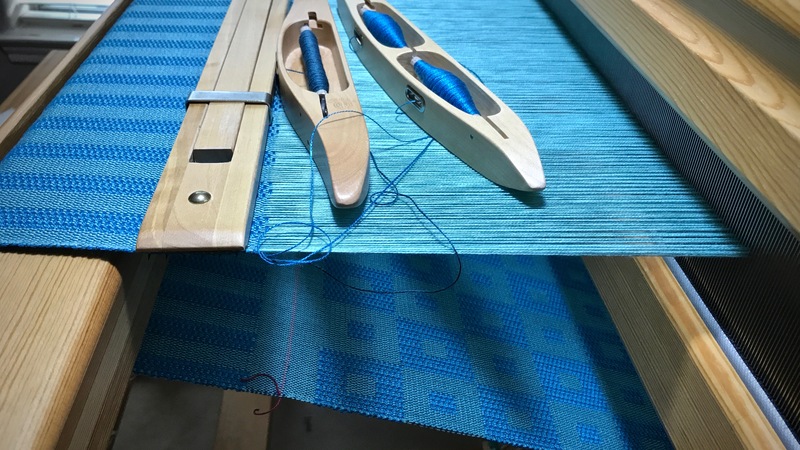 The very first project on my first floor loom was fabric for a throw pillow, with a cottolin warp and 16/2 linen weft. Unsightly selvedges are nowhere to be seen! 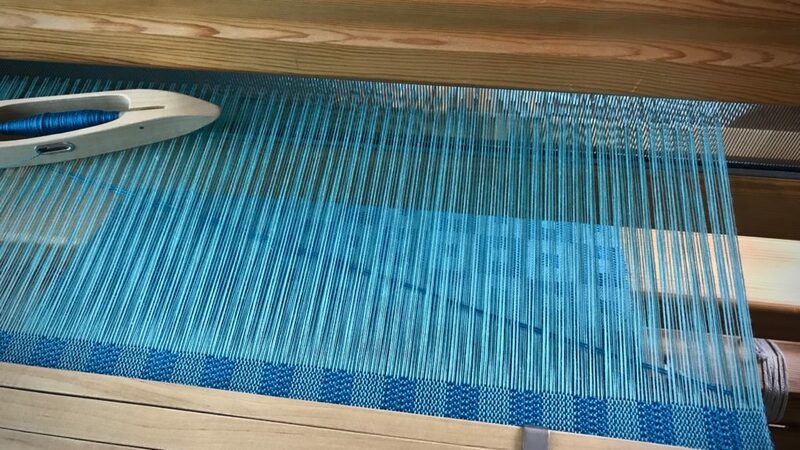 First project on the Glimåkra Standard floor loom. Enjoy this little slide show video I made for you. May your handwoven fabric be put to good use. I loved the slideshow! The pillows are so pretty…enjoy your Friday! Geri, I’m so glad you liked it. That makes me very happy! Love your slide show, Karen! Your pillows are lovely……….just like everything you make. That’s so sweet of you, D’Anne! Karen, I adore those dice weave pillows especially the beige and cranberry version. Lovely work! Martha, That dice weave fabric was a lot of fun to weave! I’m pleased that you like the pillows! the 3 chairs reminded me of Goldie locks and the 3 Bears.. great pillows! Shirley, Ha ha, wonderful! I just read that story to my granddaughter last week. Liberty, Wonderful! Thanks so much for telling me. Just lovely! 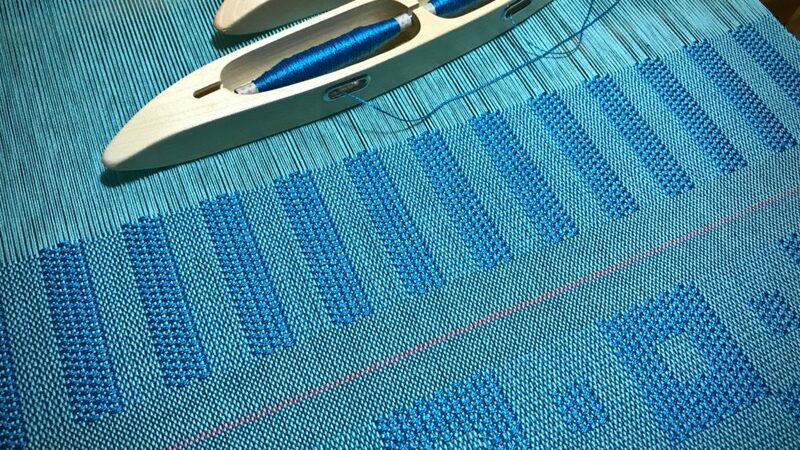 May I ask if these are plain weave? and what your epi (or epcm) was? And did you beat firmly? Or equal to warp? I don’t have a Glimakra – yet. Hoping to find one in the next few years. VavStuga biased me. I’m away from home at the moment, so I don’t have my project notes to refer to. 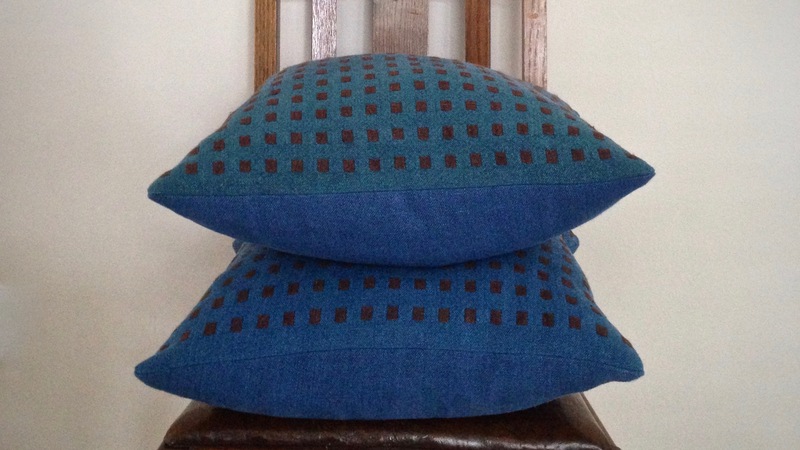 The one plain weave pillow is from the first fabric I wove on my floor loom. The other pillows have various other weave structures. The plain weave pillow is probably about 24 epi, and I did beat it firmly. 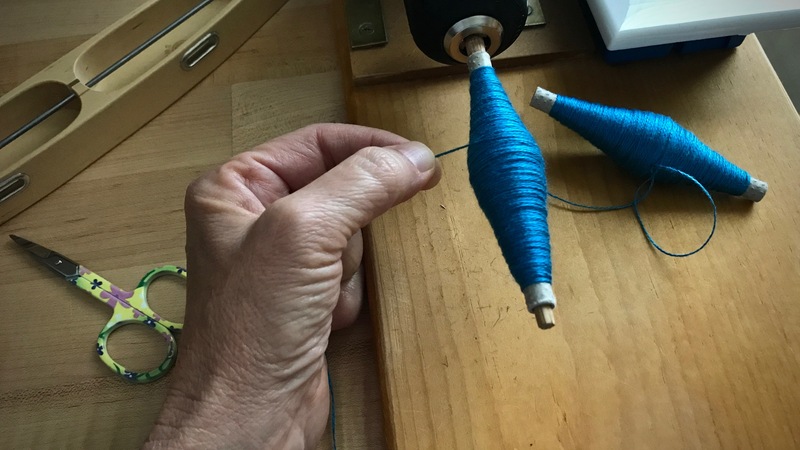 The weft picks are equal to the warp ends per inch. I hope that helps. I understand being swayed by time at Vavstuga. I hope your Glimakra search is successful! Very inspiring. Thanks to you, I’ve decided to weave the fabric for pillows for my loveseat. Thank you! That sounds super! I’d love to see your pillows when you’re finished. Thank you for your information! And congrats to you for a new beautiful Lucia in your life.